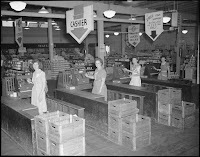 Linda Shenton Matchett: Wartime Wednesday: Boomtowns! 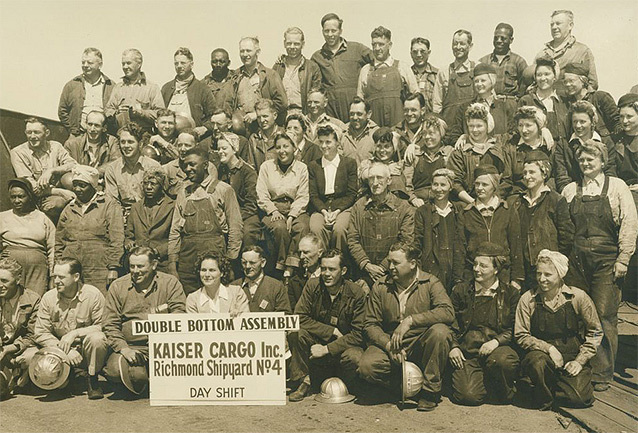 One of the myriad ways WWII impacted America was the migration of huge numbers of people from farms and rural areas to the cities, mostly in search of well-paying defense jobs or to volunteer with one of the many organizations created as a result of the war. Already industrial centers, many cities grew at phenomenal rates to became "boomtowns." For example, Richmond, California more than quadrupled in population from less than 24,000 to well over 100,000. Washington, DC was another city that exploded in growth as tens of thousands of workers joined the swelling ranks of bureaucracy. 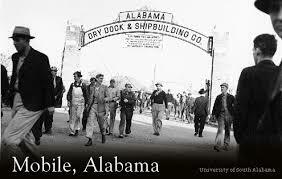 Mobile, Alabama burgeoned with humanity with the influx of workers to the shipyards. One issue that arose in most of these boomtowns was the shortage of food; even if a person had the appropriate ration stamps required to purchase an item, it was difficult to find items. Why did this happen? Food allotments were made to areas based on the 1940 census (before the growth occurred)! Didn't see that one coming, did you? Listen to what Melissa Meethe, Mobile, Alabama says about her experience: "There was no meat. If you found any it looked so bad...that you were afraid to buy it. After some months we found a farmer thirty miles up in the country who would sell us chickens and eggs. One of us women would drive up every couple of weeks and bring back a dozen chickens and a case of eggs to be shared among four or five families. Those with the plentiful shrimp and fish provided our protein for years." According to Melissa there were lines everywhere and grocery shopping could take more than an hour to complete because of waiting. I dislike grocery shopping - a lot! I can't imagine adding the frustration of limitations, poor quality, and long lines. Following the war, many of the people who relocated to the cities stayed in their new homes. How about your family? Did your parents or grandparents migrate as a result of the war and then remain in the new location? My maternal grandparents lived on indian reservations as my grandfather was employed by the government. They were based in Arizona but travel quite a bit till the end of the war. My paternal grandparents had immigrated to the states before the war and were living in new York city since my grandfather worked for the telephone company at the time. That is fascinating! I would love to hear more about that. We took a short term mission trip to the Lakota Reservation in SD. I feel like we only scratched the surface. Interesting post, Linda. We will never know everything they sacrificed to bring down Hitler. On the boomtown front, Ken Burns featured Mobile in his "The War" series. I agree with you. I didn't' remember that about "The War." I watched the series and own the book. I'll have to go back through it.